Approximate quotation “The Fortune 500 are the obvious targets. The top 30 of those have the technical capability to deal with cyber threats. The 470 other companies are screwed.” So are, for example, small midwest specialty suppliers, who are being regularly penetrated by the Chinese. It’s so much cheaper to steal their IP than to duplicate their two decades of innovation, trial and error. In the June 2013 announcement of iOS 7, Apple emphasized changes in the Find My iPhone app and service. With good reason: the new version makes any iOS device far less attractive to steal, erase, and resell, plus it provides more location-tracking data. These improvements should reduce thieves’ interest in iOS devices because they won’t be easy to sell or fence, and might help law enforcement track down less-wary criminals more often. Apple added this feature because mobile carriers (at least in the United States and several other countries) have shown little interest in helping their customers recover stolen mobile phones or eliminate the value of those phones at resale. Both GSM and CDMA phones have unique, burned-in hardware identifiers — the IMEI and MEID, respectively — and carriers know which ID is associated with your account. If you report a phone as stolen, the carrier could prevent that ID from being reactivated, provide you with information about its location, notify law enforcement, seize it when brought into a store, and so forth. Carriers do essentially none of that. As a result, expensive smartphones with high resale value, like the iPhone, have become desirable targets for thieves, and account for a significant percentage of serious crimes in many cities. For instance, cellphone-related thefts accounted for 41 percent of serious crimes for six months earlier this year in San Francisco, 40 percent of robberies in Washington, D.C., and over 50 percent of all street crime in New York City. With iOS 7 and Find My iPhone, Apple now has the technology to stop iOS device theft in its tracks, although the company couches these capabilities in terms of “lost” iPhones, not stolen ones. No one wants to think about theft, but we all misplace things. Thanks to Tyler Cowen for the link to this NYT piece by James Risen and Eric Lichtblau. I've been casually following Palantir Technologies for some time. They are arguably one of the “new disruptors” and by chance happen to be headquartered next to the Phillz Coffee that we favor in Palo Alto (Phillz is of course full of Palantir and other denizens of the brain-powered companies based around Palo Alto). From listening to a couple of podcast interviews with CEO Dr. Alex Karp, I understood Palantir's specialty was to help clients such as drug developers or intelligence agencies discern patterns in mountains of data. Palantir is not an automated data-mining algorithms company. Their secret sauce is enabling human brainpower to analyze enormous and often separate data sets. So visualization of relationships is an important part of their solutions. Palantir has a large number of YouTube videos – conference lectures, demos, and “Palantir 101” type overviews. Further to the cognitive computing topic, I'll also note that IBM Research Director John Kelly is speaking tonight at the Computer History Museum in nearby Mountain View. We immediately tried to reserve seats, but Kelly's talk is already sold out. His book Smart Machines: IBM’s Watson and the Era of Cognitive Computing , will be published in the fall by Columbia University Press. You can read a free chapter here. We’re calling for greater transparency–asking the government to let us publish in our Transparency Report aggregate numbers of national security requests, including their scope. Here’s our letter to the US government. Bruce Schneier discusses how the increasing Power and Efficiency off password cracking makes careless users increasingly vulnerable. …The article goes on to explain how dictionary attacks work, how well they do, and the sorts of passwords they find. Steube was able to crack “momof3g8kids” because he had “momof3g” in his 111 million dict and “8kids” in a smaller dict. So get yourself a secure password manager. As I write 1Password is still on half-price sale! And here is the referenced Ars Technica article: Anatomy of a hack: How crackers ransack passwords like “qeadzcwrsfxv1331” For Ars, three crackers have at 16,000+ hashed passcodes—with 90 percent success. Internet Companies Deny They’re Helping the NSA Collect User Data. Should We Believe Them? (…snip…) What to make of this? It would be stupid for them to deny this, and then get sued by their customers when it turns out it’s not true. 5. The companies know, and those statements are very carefully worded. All of these are in some way unbelievable. #1 is asking for a class action suit that destroys your company. #3 involves some very suspicious national security reporters at two different outlets simultaneously getting duped. And #2 strikes me as extremely unlikely. I can imagine one rogue employee doing this without telling his employers. I cannot imagine the exact same thing happening at nine of the biggest internet companies. The most likely possibilities seem to be #4 or #5: the NSA is filtering this stuff at some point outside the companies, or the companies have issued some very, very carefully worded statements. I recommend reading Megan’s entire essay, typically well-done. Something isn’t right about the headlined story, but I don’t have any knowledge of what (if anything) has actually been going on. It’s pretty much a non-issue for us as we assume governments have access to any electronic communication we use (including any phone or internet link). Presumably anyone wishing to prevent governments from “reading their mail” uses at least a VPN and, as insurance, robust encryption inside the VPN tunnel. A friend alerted us today to this Security Ledger bulletin on Jeremi Gosney's GPU rig. For those concerned that their online accounts may not be secure there is a series of Seekerblog posts that may be helpful (all have the tag Security). Regarding the risk posed by these ultra-fast cracking farms, check out Steve Gibson’s “password haystack”. 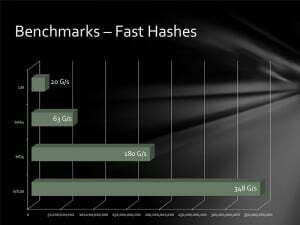 And remember that these fast-crackers are only relevant to physical access cases — where the bad guys either have your computer/device, or they have physical access to a site's password hash files. If you have a 30-character passphrase you are probably safe from even the direct physical attacks. Do make sure your phrase is not in a dictionary, which you can easily ensure by adding say ….. somewhere. Bandits trying to brute force your Gmail account over the internet are limited to a max attack rate of 100 to around 1000 guesses/second. To foil that sort of attack we think it is important to “silo” key accounts with unique email addresses – which do help to create a higher security fence. E.g., we create a unique email address for each high-value account, such as Apple, Google, Gmail, bank, brokerage, etc.. So make sure each such account has a unique email/login and unique/strong passphrase. I expect someday one of our key accounts will be compromised, maybe by an insider. Then we will be really glad that account was in its own silo. It's not difficult to accomplish this if you use 1Password to manage all of your sensitive data – see my post The only secure password is the one you can’t remember. Now go buy 1Password for each device that will have access to your password “wallet”. Lastly, here is Steve Gibson's analysis of one of our 26 character passwords. Note that even the 25 GPU Monster will need about 10 trillion centuries to stumble on to this one (at 348 billion guesses / second).